Is that a Podcast in your pocket or are you just happy to see me? Further insuring the cell phone's position is the center of the universe, FreeRange Communications today introduced FreeNews, an RSS news and weblog reader for mobile devices, phones and PDAs. With FreeNews, people can get feeds of Web information—such as news, sports, weather, stock quotes, or company news—directly on their phones. Using FreeNews, users subscribe to exactly the information they care about via a computer Web browser. The FreeNews server guides users through the set-up process, offering suggestions for newsfeeds, and allowing a search for all available news sources. When users connect to the Web from the FreeNews application on their mobiles, only the new articles summaries in their subscribed information feeds are pulled to their phones, making it extremely fast and efficient. "With FreeNews, people can carry the power of the Internet in their pockets," said Jon Maroney, CEO of FreeRange Communications. "FreeNews gives people the ability to bring customized, up-to-the-minute Internet information wherever they go. It's quickly becoming an essential for train commuters or people who travel frequently." FreeNews is a Java application and runs on most cell phones including phones from Nokia, Motorola, Sony Ericsson, LG, Samsung, and Sanyo. FreeNews is also available for running on RIM Blackberry devices, as well as Palm OS devices that have Java installed. It uses the data connection (GPRS, 3G, UMTS, etc.) on a cellphone or PDA to receive data. FreeNews uses both Atom and RSS (really simple syndication), worldwide standards for information and weblog publishing. 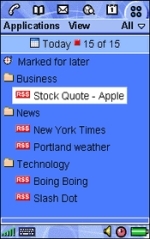 RSS provides a title and summary of a web page, along with a link to the original source web page. Users of RSS quickly scan titles and summaries for information that interests them, then click the link to see the full story. Stories of interest can easily be emailed to friends or colleagues. FreeNews is available immediately and is $19.95 for an annual subscription. For further information on software features and availability, visit www.freerangeinc.com. A trial version is also available for download. FreeRange Communications is a leading developer of RSS and blog focused applications for mobile phones. Our goal is to harness the increasing power of modern mobile phones to create useful applications that help people get more out of their phones. With top quality products and an experienced management team, FreeRange is playing a leadership role in the emerging mobile applications market. Sorry, but the Microsoft Smartphone platform has had RSS readers for quite some time now. or PocketPC which synchronizes with your online subscriptions. Just import your subscriptions (OPML) to the website and choose which feeds you want mobile enabled. All configuration (adding,organizing etc) is done online so you never have to type anything on your mobile device. Just scan and click your feeds on your mobile with ease. ability to clip articles to your online clipboard and share it as an RSS feed. LinknSurf enables users to subscribe to any RSS feeds, read blogs on their mobile phone. Users can also post their blogs to Blogger/LiveJournal. It also enables users to discover new blogs or communicate with people of similar interest - all from their mobile device.